“We know no court decision can undo this tragedy”, said a Time Warner spokesman after a court ruled they had to pay $5.78 million for blowing up a Kansas City building. The tragedy was the $5,782,391.57. When i went to switch my PG&E service from San Francisco, i learned that Petaluma is served by Sonoma Clean Power, whose electricity is 33% from renewable sources and costs less than PG&E’s Reddy Kilowatt’s®, not of course that PG&E’s isn’t considerably cleaner than that black stuff from coal sold in most of the country. If you want to pay a bit more, you can get electricity that’s 100% renewably sourced, and i expect to switch to that after i see how much my power bill is up there. I mean, considering all my loose talk about being green, it would be hypocritical not to opt for cleaner power if i can afford it. After he finished switching my service, the PG&E service rep asked if he could connect me to something called AllConnect, which would offer me additional service options. So i said yes, whereupon the Allconnect guy told me that Sonic – my long time provider of Internet service, telephone, and web hosting – does not serve Petaluma, but he could offer me fabulous deals with Comcast, AT&T, etc. Fortunately, the lying scumbag was so eager to get me to sign up that i smelled his innate rodentry. Caveat emptor. I contacted Sonic and discovered that they do, in fact, serve Petaluma although in keeping with it being a sleepy little town, the Internet connection is only half as fast as in SF. Well, they drive only half as fast, too, so chill, dude. The rest of the good news is that Sonic can keep my current landline phone number for me even though i’ll be in the 707 area code. I’d never have dreamed this would be possible, and i’m overjoyed since i’d never be able to learn a new phone number in my state of senility. 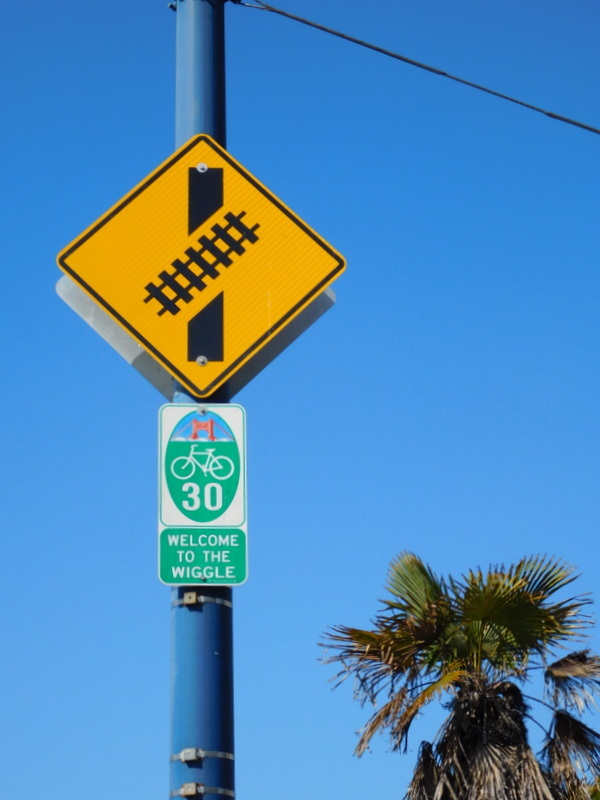 Meanwhile, some of the San Francisco quirk i’ll be soon missing, The Wiggle. That’s why i’ve gone down most roads, including the present ones. In the case of the bright green electricity in Petaluma, the jolly green pygmy offering this options is on record as saying it’ll cost only 5% more than PG&E’s rate. the complicator is that the pygmy’s rate for the light green stuff is somewhat less than PG&E’s rate, so the calculations are beyond my willingness to endure. Thus, i’m just gonna wait for a couple of bills before i leap into purity.